My Poppy Bear is sooooooooooo sad. And so I am. My Poppy Bear is sad because she is deaf just like me. I'm very lucky as the hospital gave me hearing aids to help me hear. But I asked Build A Bear where Poppy was born, if they had any hearing aids for her. I was told "No" because you only sell them online in North America. 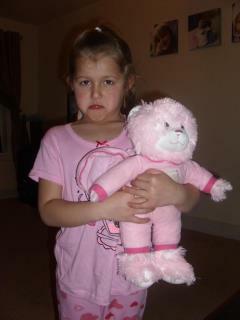 Please Build a Bear, can you please send me two hearing aids for my Poppy Bear to help her hear just like me. "BUILD A BEAR POPPY IS DEAF. HER BEST FRIEND CHLOE AGED 6 IS REALLY SAD. SHE IS DEAF, JUST LIKE HER POPPY BEAR. Chloe would love to get some hearing aids for her best friend Poppy but you only sell them in North America." Karen Jackson has been searching for a hearing aid accessory for her two deaf daughter's teddy bears but has had no luck... However this week she discovered that Build a Bear US do themselves supply an hearing aids for bears that are deaf. Karen immedietly emailed the company asking whether the accessory was available in the UK; the answer was no. So Karen asked whether Build a Bear would consider beginning to supply hearing aid accessories in the UK - but again the answer was no. Not one to give up Karen and her daughter posted a message on the Build a Bear Facebook Page, along with a photo of Chole and her bear Poppy, encouraging other parents to comment and show the company what a demand there is for the accessory in the UK. The response from parents has been great so far with so many reasons being given for why the accessory is so important! "It would be really wonderfull if B.A.B can supply teddy hearing aids in the uk, it would help alot of children and encourage them to wear there hearing Aids as teddy will be wearing his/hers to, i know my 7 year old would be made up if they was available in the uk, and it helps to spread awarness of deafness and hearing Aids to children in a lovely way." "Its totally necessary for deaf kids to have positive images of deafness in any form! if when a kid gets aids or an implant then they might not know anyone else with them. if their bear has hearing aids too and is maybe given them at the same time it will make it easier!" These parents are right, it is so important for deaf children to have something they can identify to that will encourage them to see their deafness as a positive thing. Having a best friend bear with hearing aids might encourage younger children to wear their hearing aids. Please show your support for this amazing mini-campaign by clicking on the link above and either liking the post or writing a comment about why you feel Build a Bear should supply hearing aids for all those deaf bears out there!